Explain with sketch, a pneumatic circuit for speed control of bidirectional motor. Varying the rate of flow of oil will vary the speed of the actuator. Speed control is possible using meter in circuit, meter out circuit, bleed off circuit or by placing flow control before the DCV. Speed control of bi-directional air motor: Bi-directional air motor rotates in clockwise as well as anti-clockwise direction. The speed of bi-directional motor is controlled as shown in fig. The speed control of motor by using variable two flow control valves having built-in check valve and 4x3 DC valve having zero position or central hold position with Pilot S1 and S2. ( Lever / Push button / Solenoid may be used ) When Pilot S2 is operated, port P will be connected to port A of air motor and motor will start rotating in clockwise direction. Its speed can be controlled by using variable flow control valve F1. Port B of motor will be connected to exhaust R and air in motor will be exhausted through port R via DC valve. When Pilot S1 is operated, pressure port P will be connected to port B of motor and naturally motor will start rotating in anticlockwise direction. Port A will be connected to port R and air in the motor will be exhausted through port R via DC valve. List the factors to be considered for selecting the pipe while designing the pneumatic system. Give specification of pipes for the pneumatic system. Draw and explain pneumatic meter in circuit to control of speed extension. valve. FCV is placed at inlet of the cylinder. Cap end port “C” is inlet for extension and rod end port “R” is inlet for retraction. 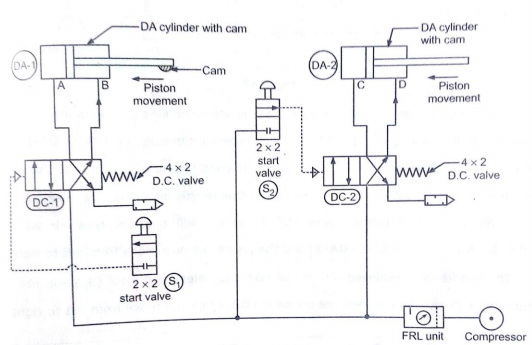 Working: In first position of 4/2 DCV, compressed air flows from P to A and B to T. this flow is through flow control valve, the flow is controlled and hence piston extends slowly. In second position 4/2 DCV, compressed air flows P to B and A to T. this flow is through check valve. This is free flow. Hence the piston retracts at higher speed, Which is not controlled. 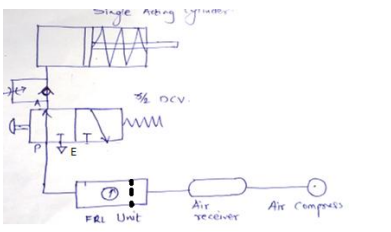 Explain with neat sketch (position based) working of sequencing circuit for two double acting Air cylinders. 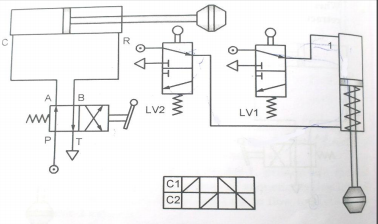 Explain with neat sketch (position based ) working of sequencing circuit for two double acting Air cylinders. Pneumatic double acting cylinders can be operated sequentially using a sequence valve or by using position based method. In pneumatics, use of sequence valve is not popular. Position based sequencing is possible using roller operated DCV or solenoid operated DCV. Various components required for Position based sequencing using roller operated DCV are as follows. I. Double acting cylinder - 02 Nos. II. 3/2 roller operated DCV – 02 Nos. III. 4/2 or 5/2 DCV – 01 No. IV. FRL Unit, Compressed air supply, hose pipes etc. Components are connected as shown in figure. Working: In the first position of lever of 4/2 DCV (5/2 DCV can be used), the DAC extends. By the end of extension of first DAC, the cam presses roller of valve LV1 hence compressed air flows to second DAC, and second DAC extends. When the lever of 4/2 DCV is shifted to second position, DAC retracts. By the end of retraction of first DAC, the cam presses roller valve LV2, hence compresses air flows to second DAC and second DAC retracts. Develop a pneumatic circuit for operation of two DA cylinders such that one operates after other using travel dependant sequencing. 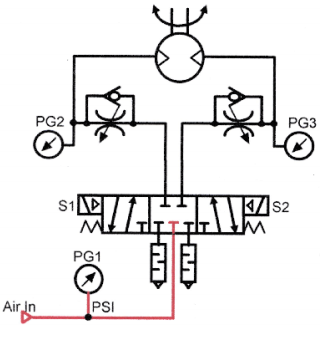 Answer: a pneumatic circuit for operation of two DA cylinders such that one operates after other using travel dependant sequencing as shown in fig. Explain pneumatic impulse circuit with neat sketch. 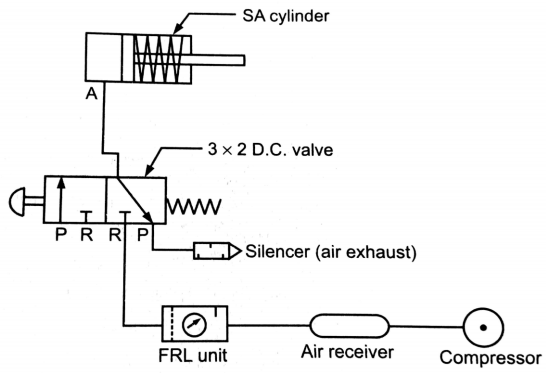 Figure 1 shows a symbol circuit of an impulse-valve controlled double acting pneumatic cylinder (A). The position of the impulse-valve (3), which is controlled by the start/stop-valve (1) and the end position valve (2), determines if the cylinder piston shall make a positive stroke and negative stroke. Positive piston stroke is initiated by manual activation of the start valve (1). Negative piston stroking takes place when valve (2) is activated by the cylinder rod at the position a1. 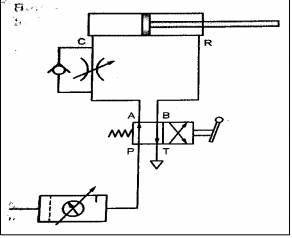 Explain pneumatic circuit for speed control of single acting cylinder with neat sketch. Pneumatic cylinders can be directly controlled by actuation of final directional control valve as shown in fig. These valves can be controlled manually or electrically. This circuit can be used for small cylinders as well as cylinders which operates at low speeds where the flow rate requirements are less. When the directional control valve is actuated by push button, the valve switches over to the open position, communicating working source to the cylinder volume. This results in the forward motion of the piston. When the push button is released, the reset spring of the valve restores the valve to the initial position [closed]. The cylinder space is connected to exhaust port there by piston retracts either due to spring or supply pressure applied from the other port. How can the speed control of any actuator be achieved? 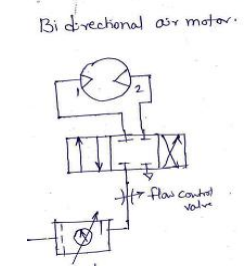 Explain the speed control circuit of bi directional air motor with sketch. Speed control of any actuator (Cylinders or motors) can be controlled using flow control valves. Varying the rate of flow of oil will vary the speed of the actuator. (Explanation 1Mark)  In meter in circuit, rate of flow of oil is controlled at inlet of the actuator.  In meter out circuit, rate of flow of oil is controlled at outlet of the actuator.  In bleed off circuit, rate of flow of oil is controlled in the by-pass line leading towards the tank. Speed control of bi-directional air motor: (Sketch 1Marks and Explanation 2 Marks) Bi-directional air motor rotates in clockwise as well as anti-clockwise direction. The speed of bi-directional motor is controlled as shown in fig. The speed control of motor by using variable two flow control valves having built-in check valve and 4x3 DC valve having zero position or central hold position with lever L1 and L2. When lever L1 is operated, port P will be connected to port A of air motor and motor will start rotating in clockwise direction. Its speed can be controlled by using variable flow control valve F1. Port B of motor will be connected to exhaust R and air in motor will be exhausted through port R via DC valve. When lever L2 is operated, pressure port P will be connected to port B of motor and naturally motor will start rotating in anticlockwise direction. Port A will be connected to port R and air in the motor will be exhausted through port R via DC valve.